The American Geophysical Union’s annual fall meeting is December 14-18 in San Francisco and the University of Texas Institute for Geophysics (UTIG) is there. Keep reading for featured talks or check the events calendar for day-by-day listings of UTIG presentations, luncheons and more. Whatever you do, be sure and stop by Jackson School of Geosciences’ booth #3028 and say hello. Yuko Okumura — Tuesday, December 15 — Moscone West, 3005 — 3:10-3:25 p.m. The interannual cooling of the equatorial Pacific associated with La Niña events has been known to cause drought conditions over the southern US by displacing the subtropical jet and storm track northward. Whereas strong El Niños usually terminate after the mature phase, strong La Niñas tend to persist for 2 years or longer, thereby potentially exacerbating the situation. To investigate the impacts of multi-year La Niña events on the extent and persistency of drought in the US, a suite of observational data is analyzed for the past century. Composite analyses based on 10 multi-year La Niña events reveal distinct seasonal evolution of oceanic and atmospheric anomalies during the course of events. During the second year, the peak cooling of the equatorial Pacific weakens while the meridional extent of the cooling is nearly unchanged. Despite the weaker equatorial cooling, precipitation anomalies over the US remain of similar magnitude and the region of reduced precipitation extends further to the north during boreal winter-spring of the second year. These features are robust across different datasets and composite periods. Analysis of atmospheric teleconnections suggests that the reduced meridional gradient of equatorial cooling results in a broader meridional structure of upper tropospheric circulation anomalies, shifting the subtropical jet further to the north. An atmospheric model forced with observed multi-year La Niña SST anomalies shows a similar change in the atmospheric teleconnection patterns from the first to the second year although the difference is much less pronounced compared to observations. Given the sustained impacts on drought, it is crucial to predict the duration of La Niña events in advance. Yosio Nakamura — Wednesday, December 16 —Moscone South, Poster Hall — 1:40-6 p.m.
Our effort to make the Apollo Lunar Surface Experiment Package (ALSEP) data, acquired from 1969 to 1977, readily available to current and future researchers, as reported in this session last year, has made us realize some potentially serious problems that may be common to legacy scientific data. One such problem was the loss of key information contained in the original data. This happened (a) when the original investigators thought it was enough to archive only the data of interest to contemporary researchers; (b) when the data were reformatted to make them readily decipherable to current researchers by someone who did not fully understand the details of the data, thus introducing incorrectly translated information; (c) when errors associated with reading of the original data were not corrected; and (d) simply due to a programming error in reformatting. The only sure way to avoid such a problem is to archive the raw experimental data in addition to the processed data, even though they may not be readily decipherable to most current researchers. For such raw data to be useful, it is also important that complete metadata necessary to interpret the raw data be preserved. Adrien Arnulf — Thursday, December 17 — Moscone South, Poster Hall — 8 a.m.-12:20 p.m.
On the Juan de Fuca ridge, Axial volcano is the most volcanically active site of the northwestern Pacific and it has been continuously monitored through two complete eruption cycles, with an increased number of seafloor instruments, leading in 2014 to the deployment of a permanent, wired-to-shore, seafloor observatory. Accurate imaging of the internal structure of volcanic systems is critical in order to characterize and quantify mass and energy transport mechanisms in such dynamic environments. 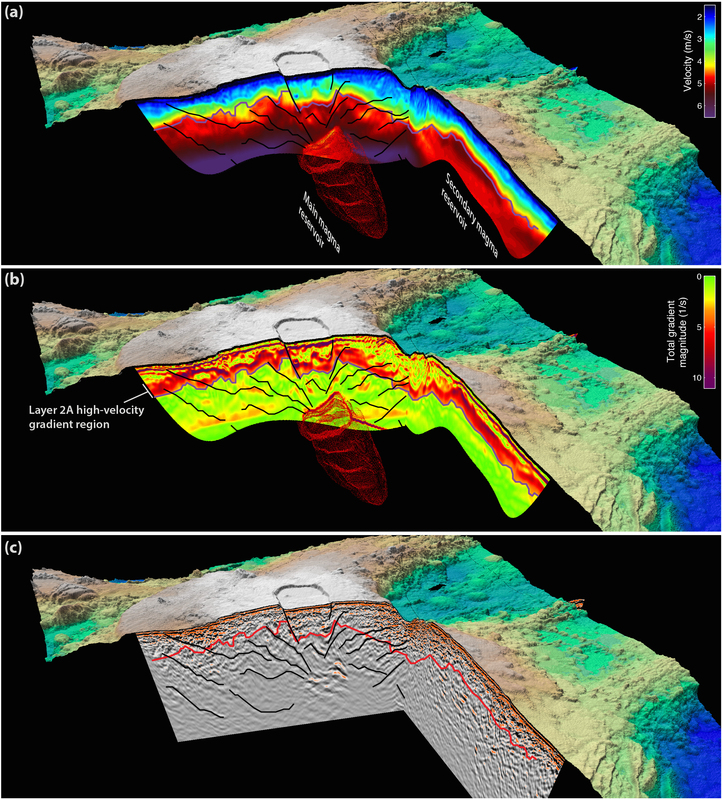 To produce high-resolution velocity/reflectivity structures of Axial volcano, here, we combined a synthetic ocean bottom experiment (SOBE), 3-D traveltime tomography, 2D elastic full waveform and a reverse time migration (RTM) formalism. We present an updated and more complete outlook of Axial volcano upper crustal structure. We find that the addition of 469,891 traveltime arrivals, from twelve different multichannel seismic lines, to a previous OBSs-based traveltime tomography inversion, greatly improved the resolution of the three-dimensional velocity structure. 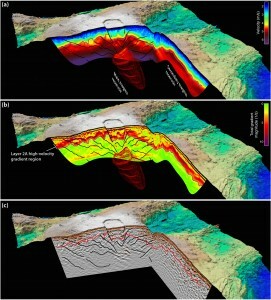 We observe two elongated crustal magma reservoir beneath the central volcano. We investigate the extent, volume and physical state of those magma reservoirs and provide images of the volcanic plumbing system. We use our 3D velocity structure to relocate several months of seismicity and track magma movements between the caldera and the eruption site. We show that crustal-aging is controlled by pipe-like pattern of focused hydrothermal circulation. 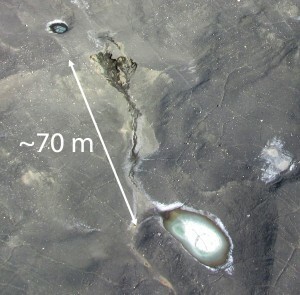 We suggest that the subsiding caldera floor at Axial Volcano was initiated ~720kyr +/-100kyr and provides a near perfect trap for the ponding of lava flows. Joe MacGregor — Thursday, December 17 — Moscone West, 3007 — 11:20-11:35 a.m. The thermal state of an ice sheet’s bed (frozen or thawed) is an important control upon its history, present dynamics and future vulnerability to external forcings. However, this thermal state can only be either observed directly within sparse boreholes or inferred from the presence of subglacial lakes. Hence, indirect inferences of this state are required for the vast majority of an ice sheet. Here we synthesize new and existing spatially extensive inferences of the present thermal state of the bed of the Greenland Ice Sheet to better constrain this state, identify the most poorly constrained regions and inform ice-flow modeling. New remote inferences of this basal thermal state are derived from modeling of this ice sheet’s radiostratigraphy, analysis of surface imagery and interpretation of surface-velocity patterns. Existing inferences include outputs from thermomechanical ice-flow models with varied spin-ups, forcings and underlying assumptions. Between similarly forced models, there is general agreement regarding the thermal state of the bed, except where this state transitions from frozen to thawed. Both observations and modeling generally agree that the Northeast Greenland Ice Stream (NEGIS) and significant portions of the southwestern ice-drainage basins are thawed at the bed, while the vicinities of central ice divides, particularly their west-facing slopes, are frozen. There is poor agreement regarding the basal thermal state within the NEGIS drainage basin outside of NEGIS itself, above ~2000 m surface elevation in the southern drainage basins and along the eastern ice-sheet margin. Further, remote inferences and modeling rarely represent the observed basal thermal state accurately at NorthGRIP, DYE-3 and near northeastern subglacial lakes. This synthesis identifies large regions of the Greenland Ice Sheet where additional observations could significantly improve assessment of its basal thermal state, and where the ice sheet is likely most sensitive to millennial-scale external forcings. Finally, we discuss the possible sources of disagreement between the observed and modeled basal thermal state. Joseph Levy — Thursday, December 17 — Moscone West, 3005 — 12:05-12:20 p.m.
We report on measurements of soil hydrological and thermal properties from the McMurdo Dry Valleys of Antarctica (MDV), and relate them to changes in the spatial patterns of shallow groundwater flow (water tracks), landscape subsidence (thermokarst), and microbial and invertebrate ecosystem response. We show that shallow groundwater in the MDV is primarily derived from snowfall and seasonal ground ice melt, but is evaporatively concentrated during the summer flow period to produce saline to hypersaline active layer solutions. Multi-year profiles of soil temperature and soil moisture indicate that water track flow is largely limited to the duration of active layer conditions (~2 months) and that water track discharge is characterized by an early season pulse as ground ice melts, and a late season pulse as solutions flowing downslope accumulate at the base of the water tracks. Evaporative concentration of water track fluids, coupled with soil salt dissolution, and/or cation exchange reactions, result in enrichment of water track fluids in chloride and sulfate salts (depending on local soil chemistry) such that initially fresh snowmelt becomes saline to hypersaline over several km of groundwater flow. These brines shape soil ecosystems in the MDV by controlling salinity-dependent habitat suitability for invertebrates and microbial organisms. We show that these soil salts and shallow groundwater solutions accumulate in local depressions to form ponds, and that where these ponds are located above buried ice, the presence of salts leads to expansion of the basins to form large thermokarst depressions. Because water tracks are primarily snow-fed, and are moderated by shallow groundwater processes, they represent a component of the Antarctic hydrological system that is likely to respond rapidly to regional changes in temperature and precipitation, altering Antarctic terrestrial ecosystems, carbon budgets, and ground ice distribution.